The Feast of Jacobus Burgundus Molensis – Zero Equals Two! for his name was in letters of fire. Did not the Order of the Temple prepare the Renaissance by fusing the Mysteries of the East and West? March 19 is the Feast of Jacobus Burgundus Molensis the Martyr, a Gnostic Saint more commonly known as Jacques de Molay. 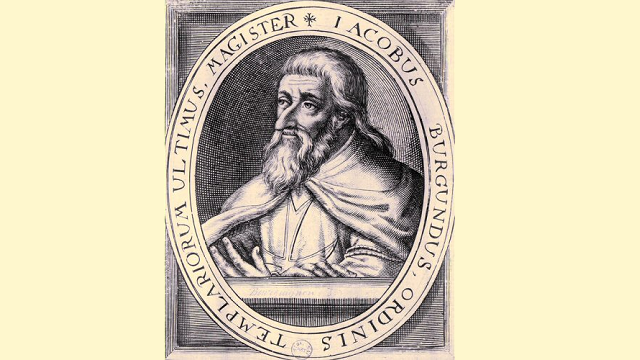 He was the 23rd and last Grand Master of the Knights Templar; he led the Order from 20 April 1292 until its dissolution by Pope Clement V in 1307. Little is known of his life outside of the Templars. In fact, even his date of birth is unknown. Caudell – a frothy wine or ale-based drink. Gehalbirte ayer – stuffed eggs. French iowtes – peas porridge with onions. Cabochis – a simple cabbage dish. Potage for somer season – a pottage of pork, veal, & almond milk, coloured with violets.